On my way home tonight, I spotted that the sun had managed to catch this glass partition outside a cafe beautifully to create these long rainbows along the pavement. Why wouldn’t that make you smile? 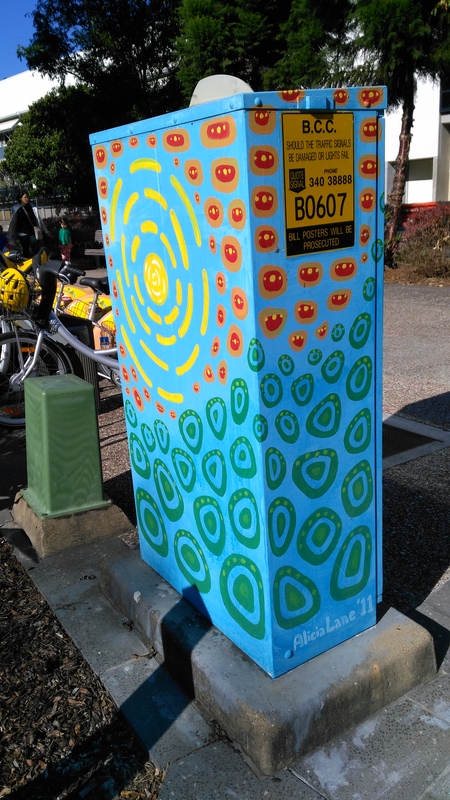 Have I mentioned the painted junction boxes here in Brisbane? Oh yeah….I have…the spaceship, ekka, and dancing boxes have already featured. And I can assure you, there’ll be plenty more. Why, because so many of them are painted, and I love the colourful feature it makes out of what could be another bit of boring street furniture. So here is what I’m calling the sunshine junction box.